"Ah, the taste of summer. 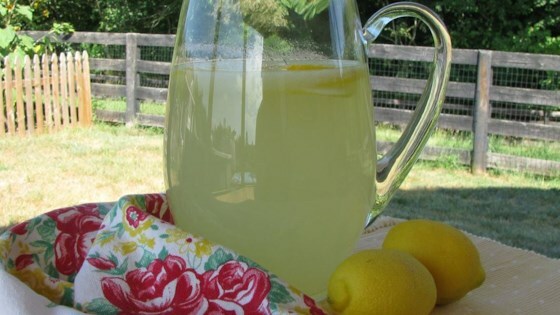 This classic lemonade recipe is the one my mom used to make for me when I was little. It's the perfect combination of sweet and tart! When using a clear pitcher, adding a few of the juiced lemon halves makes it look prettier." I thought this was very good and it beats the store bought kind by a mile!!! I did think it was slightly too sweet, but that is very easily modified. I will definitely make this again!! We are huge lemonade fans and this recipe is darn near perfect. Just exactly the right amount of tart and sweet. We really liked this alot. Thanks for sharing. I like mine a little tarter, so I added extra lemon juice. This is the best lemonade I've ever tasted!! Try it!